M.Tech in Mechanical Engineering from Maharshi Dayanand University (MDU), Rohtak - 2015. AMIE (B.Tech) in Mechanical Engineering from The Institution of Engineers (India) - 2012. DME from Rajiv Gandhi Proudyogiki Vishwavidyalaya (RGPV), Bhopal - 1999. 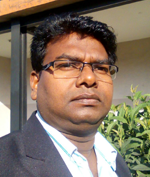 Working as an Lecturer in OP Jindal University, Raigarh (C.G), from Apr 2013 to till date. Worked as a Technical Assistant at OP Jindal Institute of Technology, Raigarh (C.G), from Jun 2008 to Mar 2013. Worked as a Technical Assistant at M P Christian College of Engineering & Technology, Bhilai (C.G), from Nov 2005 to May 2008. Worked as an Instructor (Workshop) at Rungta College of Engineering and Technology (R1), Bhilai (C.G), from Dec 1999 to Nov 2005. Green Steel Technology, Advanced Welding Technology. Jitesh Kumar Singh, Arun Kumar Rout, Advances in Green Steel Making Technology- A Review, American Journal of Materials Engineering & Technology (AJMET), Volume 6, Issue 1, page 08-13 July- 2018. Jitesh Kumar Singh, Aviral Singh Bais, Electricity Generation by airfoil Designed Vertical axis wind Turbine, International Journal of Engineering & Science Research (IJESR), Volume 8, Issue 6, page 34-42 July- 2018. Jitesh Kumar Singh, Roshan Malakar, Keshav Verma, Building of Mini-Biogas Plant using Anaerobic Digestion of Organic Compound, International Journal of Modern Trends in Engineering and Research (IJMTER), Volume 4, Issue 1, Volume 8, Issue 6, Pages 150-155 January- 2017. Jitesh Kumar Singh, Roshan Malakar, Keshav Verma, Shitesh Nayak, Automatic Mechanical Sprocket Side Stand retrieve system, International Journal of Advanced and Innovative Research (IJAIR), Volume 5, Issue 3, Pages 73-77 March- 2016. Jitesh Kumar Singh, Vehicle Handling Improvement by Adaptive steering System, International Journal of Engineering and Innovative Technology (IJEIT), Volume 5, Issue 3, Pages 48-51, September- 2015. Jitesh Kumar Singh, S. K. Bhardwaj, Non Destructive Testing of Welded Metals to Enhance the Quality of Materials, International Journal of Technical Research and Applications (IJTRA), Volume 3, Issue 3, Pages 47-51, May-June 2015. Jitesh Kumar Singh, Surendra Kumar Dwivedi, Case Study on Industrial Gantry Crane, International Journal of Engineering Science and Innovative Technology (IJESIT), Volume 4, Issue 1, Pages 305-310, January 2015. Jitesh Kumar Singh, S. K. Bhardwaj, Optimization of the Cutting Parameters by Vibration Analysis of Cutting Tool, International Journal of Latest Trends in Engineering and Technology (IJLTET), Volume 5, Issue 1, Pages 270-275, January 2015. Jitesh Kumar Singh, Identification and Analysis of Welding Defects of Submerged Arc Welding to Enhance the Quality of Welds, OPJIT-International Journal of Innovation and Research, Volume 3, Issue 1, Pages 16-19, May 2014. Jitesh Kumar Singh, Future of Green Steel Manufacturing Technology, International Conference on advances in steel, Power and construction Technology-III, March 22-23, 2017, O P Jindal University, Raigarh, C.G., India. Jitesh Kumar Singh, Building of Mini-Biogas Plant Using Anaerobic Digestion of Organic Compound, International Conference on advances in steel, Power and construction Technology-III, March 22-23, 2017, O P Jindal University, Raigarh, C.G., India. Jitesh Kumar Singh, Automatic Mechanical Sprocket side stand retrieve System, International Conference on advances in steel, Power and construction Technology-II, March 17-19, 2016, O P Jindal Institute of Technology, Raigarh, C.G., India. Jitesh Kumar Singh, Modification of Vehicle Handling by Adaptive Steering System, International Conference on advances in steel, Power and construction Technology-II, March 17-19, 2016, O P Jindal Institute of Technology, Raigarh, C.G., India. Jitesh Kumar Singh, Enhancement of the Surface Finish by Vibration Analysis of Cutting tool, International Conference on advances in steel, Power and construction Technology, January 14-15, 2015, O P Jindal Institute of Technology, Raigarh, C.G., India. Two Week Short Term Course on Functional Engineering Materials Technology, Modeling & Analysis in June-July-2018. One Week Workshop on Recent Development in Renewable Energy Technology in Dec-2015. Two Day e- Seminar on Step 2 Research in Sept.2014. Two Week Short Term Course on SOLID-WORKS in July 2014. Two Week Short Term Course on Fluid Mechanics in May 2014. Two Week Short Term Course on Engineering Mechanics in Dec. 2013. Delivered one day Guest Lecture on Welding Technology in 2018.